We have launched a shiny new SciDev.Net website and we are taking our event blog over there. Since we started this blog we have had numerous journalists cover events relating to science and development from around the world. We will continue to post from events, but over on our SciDev.Net at large blog. Thank you for joining us and we hope you continue to read our coverage in its new home. [Abu Dhabi] The dazzling prospect of environmental information technologies available to everyone in the world was conjured up at the Eye on Earth Summit in Abu Dhabi this week. The vision, however, comes with a caution. The optimistic scenario arises from a combination of geospatial technology and new online services, said Jack Dangermond, CEO and president of the US-based Environmental Systems Research Institute (ESRI). This afternoon I attended a media roundtable with South Africa’s deputy communications minister Obed Bapela and a bunch of industry bods. Vodacom (a subsidiary of Vodafone) was there, as was MTN and Cell C, and Sanlam, a South African financial services provider and health insurer. We were there to discuss a report produced by the GSM Association into the opportunities for mHealth in South Africa. The report, which can be found here (requires free registration to access it), points out that healthcare in South Africa is big business — private health expenditure is 21 times the combined revenues of all South African mobile operators. This should whet the appetites of the operators, it was thought. Of course, the majority of this expenditure is from people who have money — 14 per cent of South Africans have access to 57 per cent of the country’s health expenditure. The question, then, is how to extend mHealth services to the poorest. South Africa is meant to be migrating to a National Health Insurance system next year. 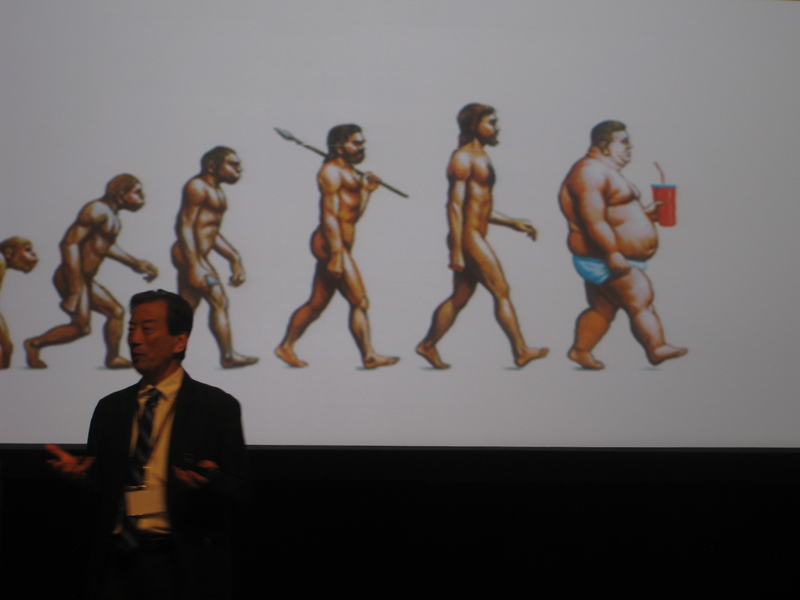 But it’s not clear where mHealth will fit into this vision. Bapela said that the country was publishing an eHealth strategy later this financial year, or early next (2012/13). The funding side is not yet resolved. “Affordability is going to be an issue,” the deputy minister said. However, several of the private sector delegates said that mHealth could actually save the government money, and should not be seen as an ‘additional cost’. For instance, it could cut paper and data-entry costs, and cut travel costs for both doctors and patients. Several issues remain to be resolved. Who will be liable if an mHealth treatment goes wrong? The mobile companies won’t want to accept the liability. So will it be the doctors, the content writers, or the health ministry? South Africa is tussling with the regulatory and policy challenges that are holding mHealth back in the country. I’m sure the same is true for many other developing countries. 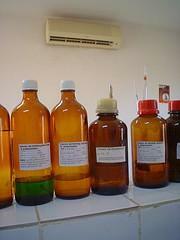 As a great add-on to the conference proper, we got the chance to see some Malian research in action today. I was pleased and surprised to see that thanks (largely) to various sources of international funding, the standard of equipment was high (similar in fact to the UK university labs that I worked in a few years ago). 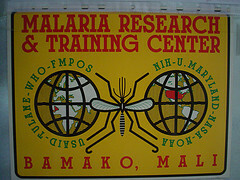 First stop was the Malaria Research and Training Centre (MRTC), part of the Faculty of Medicine at the University of Bamako, where research into malaria, HIV, TB, leishmaniasis and filariasis is underway. High on a hill above Bamako, the flower-covered campus buildings hide air-conditioned labs where amongst others things, mosquitoes are bred and monitored for mating behaviour, resistance mutations to antimalarials in Plasmodium falciparum are tracked, and Mycobacterium tuberculosis is cultured and tested for multidrug resistance. TB culture is notoriously tricky, and from the pride on the researchers’ faces as they told us “it is now easy”, the possibility of the MRTC becoming the regional centre for MDR-TB testing doesn’t seem like a pipedream. Next we were taken to the Traditional Medicine Department of the National Institute of Public Health Research, where traditional medicines are tested, processed and administered. Existing traditional medicines that healers use are first tested for toxicity, and if given the all clear are given to patients, who are then monitored for the alleviation of symptoms and any ill effects. There are many issues to iron out when it comes to traditional medicine, from the validity of such drugs — and administering them almost blind to patients — to the morality of selling a placebo effect, but the attempts being made by the TMRC to apply the scientific method to traditional drugs and to start some kind of system to approve traditional medicine healers can only be applauded. Last stop of the day, after a delicious lunch of beef skewers and rice, was a visit the Centre for Vaccine Development, where researchers are working on infectious diseases from E. coli to meningitis. But one of their main specialisations is leprosy, certainly not a trendy disease on the global health list. The centre was set up in 1934 to treat the disease and Mali still suffers a burden from leprosy so it’s especially encouraging that it remains a focus. Around 20 of us went on the visits, a paltry number considering the number of Bamako 2008 attendees. It was a particular shame as I found that the discussions with researchers really crystallised the comments made at the conference; it was inspiring to see first hand how researchers are concentrating on the health problems specific to Mali, and producing results that feed into policy. So after long hours of discussions and negotiations, the Bamako Call to Action has been agreed upon and officially announced to the world. Spending three days attending various sessions on research for health as well as sitting in on the ministerial discussions left me with three distinct impressions. First: Awareness needs to be hammered into the heads of political leaders that health is an investment, not an expense. And that no health means no development. A fairly common sense understanding I would have thought, but perhaps one that needs to be waved vigorously, and continuously, in front of the eyes of our leaders. And maybe shoved down their throats as well, considering how similar the Bamako Call to Action is to other such previous documents. Second: International bodies that have similar objectives need to be consolidated so that their efforts can be coordinated and programmes carried out more efficiently and without duplication. Similarly, governments need to set national health agendas, and these really need to be carried out across several ministries and governmental departments in order to be fully effective. Of course, I fully realise this is easier said than done. Consolidating international organisations is not impossible, but highly improbable; while getting several different governmental bodies to work together coherently and efficiently without mini turf wars erupting or plain miscommunication is as difficult as getting a stubborn donkey to move when it doesn’t want to. Not that I’m comparing government agencies to stubborn donkeys – honestly! Third: Southern countries want to become more self-reliant in terms of conducting research. Many representatives from developing nations called for national or regional capacity building, rather than relying on the North to help provide training. However, with the money still coming from developed nations, it is going to be quite a tricky balance satisfying everybody’s wants and needs, as well as avoiding any potential chips-on-the-shoulders, even if both sides have the very best of intentions. At the end of the day, I believe it all boils down to individuals. If each person who attended the Forum goes away firmly believing and committed to carrying out whichever part of the Call to Action that is the most relevant to them, we might indeed see some progress in global health. It may not be immediate, but as was said during the meeting, health is both a current and future investment. We just need to remember the big picture, but work on our small part of it. And maybe pray for visionary leaders who think in the long term, rather than the short. 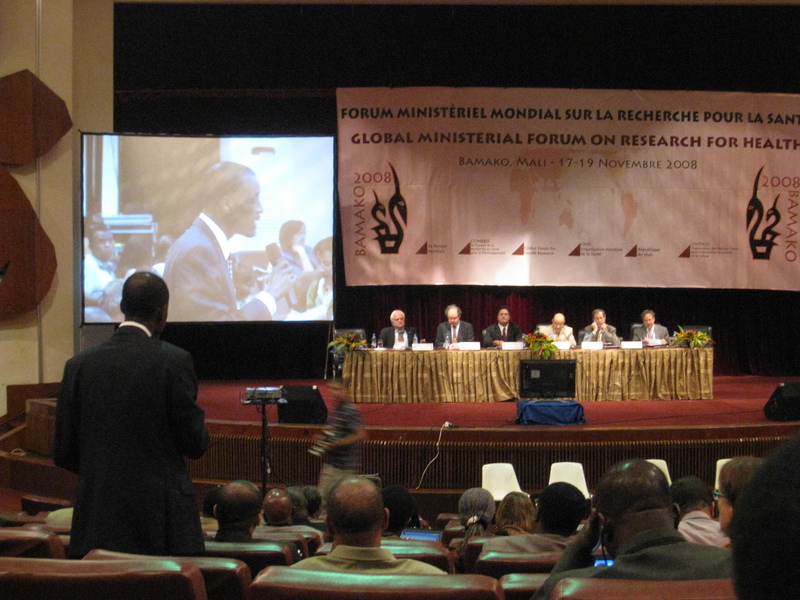 [BAMAKO] Ministers from across the developing world say they want to take control of their own health research agendas as part of a wish list presented at the Global Ministerial Forum on Research for Health yesterday (19 November). Launching the much-awaited ‘Call to Action’ at the closing event of the Forum they said they want to prioritise policies dealing with research for health and improve coordination between ministries so that their respective countries can have more ownership of research. You are currently browsing the archives for the Bamako 2008 category.